For the third consecutive year, the National Trial Team has won the regional TYLA National Trial Competition. “I am in awe of the winningest trial team coaches in Wake Forest history: Mark Boynton (JD ’97) and Stephanie Reese (JD ’96). I have no words to express how proud I am of them, and I am very seldom at a loss for words,” said Professor Carol Anderson, director of Trial Practice and the Litigation Externship Clinic. Daniel Stratton (JD ’17), Sophia Vazquez (JD ’17) and Joe Karam (JD ’18) defeated host school University of Georgia in the semi-finals and then defeated Emory University in the finals. The team now moves on to nationals March 22-26 in Fort Worth, Texas. “With only two prelimianry rounds, the pressure to be near perfect in order to make the cut increases dramatically. BOTH Wake Forest teams made the cut! Our squad of Daniel Stratton, Sophia Vazquez and Joe Karam defeated the host school UGA in the semis and then defeated Emory in the finals. Two of the judges from the panel sought me out after the trial and offered to come to Winston to judge our team in preparation for Nationals. 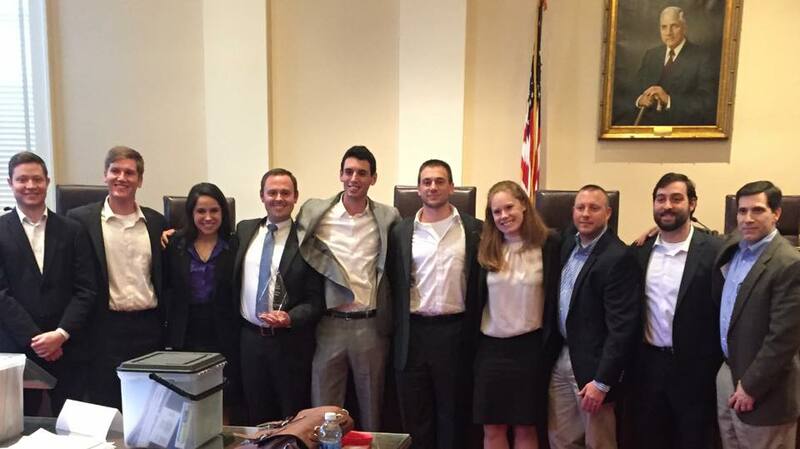 The National Trial Team, which won the regional competition, moves on to nationals March 22-26. “Our squad of Lauren Stovall (JD ’17), Brad Simon (JD ’18) and Zach McCamey (JD ’18) faced Campbell in the semi-final round and lost a close trial. Many of you will recall that Ms. Stovall and Mr. Simon joined Mia Falzarano (JD ’17) and Drew Culler (JD ’17) representing Wake Forest superbly at the National Tournament of Champions this past fall. “Our three alternates, Jon Salmons (JD ’17), Nick Bedo (JD ’18) and Shawn Poole (JD ’18) not only performed outstanding work supporting the squads during the competition but were needed to act as witnesses in all prelim rounds. Once again, coaches, competitors, judges and the host praised our students for well-prepared, intelligent and fair work as trial witnesses. “Every year I try to explain our pride in these students, this program and our school, but this year sets yet another standard. Last year we saw the real culmination of when the students practice as squads but compete as one team. This year, with the work for the Tournament of Champions and the response to the surprise schedule, we saw what happens when this entire program puts its weight behind the students. While every win is a ‘team win’ and every loss is a ‘team loss,’ the cooperation and unhesitating support of the people I listed above quite literally gave the structure for these students to compete and prevail. 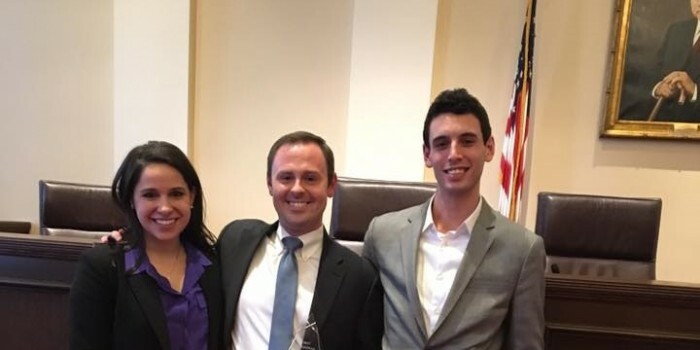 We, on the National Trial Team, are one team; but WE as Wake Forest Trial Advocacy are ONE program and when we gather our resources we accomplish amazing things. “As always, we are deeply grateful to the deans who continue to support this program and the students. Stephanie and I especially thank the group named, above without whom our team would not have been as well prepared. “Now we await the national problem materials, gather our breath and gird ourselves for Texas – AGAIN!,” Boynton concluded.